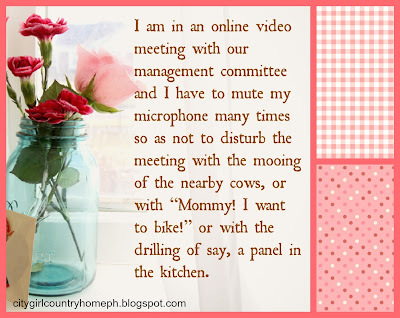 City Girl, Country Home: WAHM: Work-at-Home…M? • While chatting online with my secretary, I suddenly hear a shout: “Mooooommmyyyyy!! !” My son has awakened from slumber. I excuse myself from the chat, and go to the room. “Cuddle time…one of my favorite times…in the morning,” I sing to him a song I made up, and take some minutes to cuddle him. I lead him in his morning prayers before having his breakfast prepared. Oh yeah, then I get back to my secretary. • I focus on doing some reports, or writing, or editing…I take a break. Break = Activity Time (part of homeschooling my son). Break = “Mommy, can you play with me?” = I’m controlling one of his robots or one of his stuffed toys and we’re in some land far away. Break = Read-a-Book Time, like reading about and discussing epic battles in his illustrated Bible. 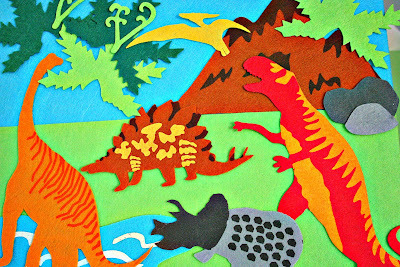 Break = I’m making up a story with his felt dinosaurs who have different preferences for music — one likes classical, one likes jazz, one likes rock, one likes contemporary worship (son and I sing the tunes together…voila, homeschool music appreciation “class”!). · Doorbell rings and it’s either the security guard with the newspaper, meat delivery guy, water delivery guy or someone who needs to talk to the hubby. · I hear my son shouting at his nanny, so I have to do some intervention for peace to reign once again. • I am in an online video call and someone from the office tells me that she sees the cook or the yaya (nanny) in the kitchen behind me. Woops…change angle. • I am in an online video meeting with our management committee and I have to mute my microphone many times so as not to disturb the meeting with the mooing of the nearby cows, or with “Mommy! I want to bike!” or with the drilling of say, a panel in the kitchen. And I can relax, because my Big Boss is also my Savior, my Strength, my Faithful Friend. Can any of you relate? Feel free to post your stories in the comments! By the way, I finally have a Facebook page. Please like the page here so you can get updates. Thanks so much and God bless you! Thanks Mich for sharing...Iam a WAHM! the "M's" in many ways: ) and yes, thank God for technology! Hi! Thanks for reading! Thank God for His grace in our WAHM life! God bless you, too! Hi Tina! Thanks for your support! And yes, there are those days of self-doubt and days just inches away from insanity, hahaha! But the Lord is so good, how He totally reassures His daughters! God bless! Appreciate you sharing your experience; it let's others see that we face similar circumstances and they can be managed.